Seen the film (on YouTube)? 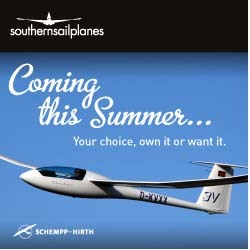 Now read the story of a surreal soaring flight, worth a billion points on the cheesy grin factor, in the Aug/Sept issue of S&G. 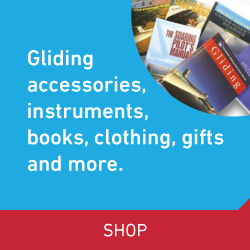 You can also discover graphic evidence of where we fly in the UK and learn how the art of soaring has developed over the past century. Imagine soaring just 200ft above the sea, without even thinking of landing. That’s the situation Matt Wright found himself in when he put the experience and confidence gained from following Trevor Stuart along the Nympsfield ridges to good use with a surreal flight on the Sidmouth Cliffs. It was a flight that often had Matt laughing out loud at the crazy scenario. So where do the rest of us fly in the UK? A discussion in the bar after a day’s flying resulted in Paul Jessop producing an impressive map of where we fly, using details of every flight entered on the BGA Ladder from 2003 to 2010. This unfamiliar landscape indicates some obvious glider ‘motorways’, but also holds some surprises. Wally Kahn looks at how the art of soaring has developed and reflects that our sport in the 21st century is far removed from his early days in the 40s. The glider on our cover is certainly far removed from today’s superships. It’s a replica of the Cayley glider, first flown in 1853, which took to the skies again recently. The pilot was Dave Holborn, who made several successful flights at the Yorkshire Air Museum during filming for the BBC’s The One Show. In the June/July issue, we looked at why the Italian Air Force insists that its pilots learn to glide. Closer to home, Yorkshire Gliding Club is involved in an air safety initiative with the RAF’s fast jet students, with each new intake of pilots at RAF Linton-on-Ouse now experiencing a day at Sutton Bank. Graham Evison reports on how the Yorkshire Initiative came about and shares his memories of a flight of a lifetime in a Tucano. 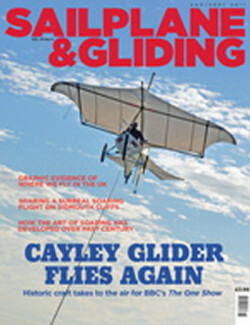 Also in this issue: BGA Chairman Patrick Naegeli reflects on the unanticipated consequences for gliding of London hosting the 2012 Olympics. Alison Randle describes how your club could be missing out financially if it doesn’t have CASC status. S&G editor Susan Newby explains why Friday the 13th was the perfect date for a 450km task in an ASH 25 EB28 from Dunstable with Steve Lynn. Ian Redstone shares the lessons he learnt in his ill-fated first cross-country flight. Peter Moorehead looks at current radiosand what can be expected of them. Andy Cockerell reports from Germany, where members of the British junior gliding squadtrained for the Junior Worlds. Chris Luton was excited about flying the LS10 in the 2011 Pribina Cup in Nitra, but did it live up to his expectations? Bruce Marshall concludes his two-part account of the early days of soaring in Scotland. We look at a single-person rigging cart featuring a remote control electric drive system and review John Marriot’s book Aerotowing Gliders. Andy Perkins reports on the 2011 Air League Flying Day at Bicester. We’ve another selection of truly stunning images in the Gallery pages, plus stunning vintage pictures taken at the VGC’s 2011 vintage rally at Nympsfield and the rare sight of five Capstans together, taken at Camphill’s vintage rally. Where do we fly in the UK?